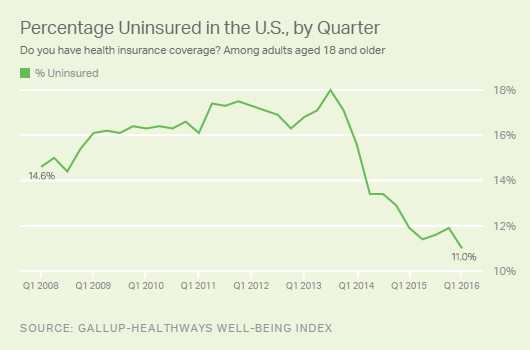 The uninsured rate for Americans has tumbled dramatically over the past few years in the wake of Obamacare and expanded Medicaid coverage. Only 11 percent of adults and children are still without healthcare coverage, according to a new survey by Gallup and Healthways. Gallup said on Thursday that the rate of uninsured is at the lowest level in eight years, especially among African-Americans and Hispanics. The trend has been positive in recent years, as the economy improved and more lower-income Americans qualified for expanded Medicaid coverage or federally subsidized private health insurance. 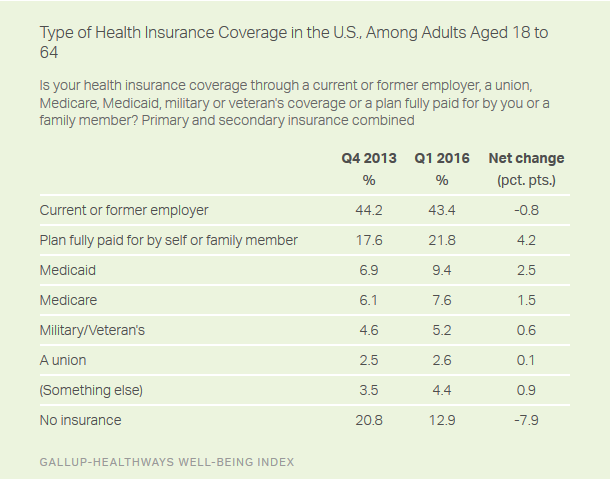 Even so, the latest figures for the first three months of 2016 are remarkable, according to Gallup: The 11 percent rate of uninsured Americans who aren’t old enough to qualify for Medicare is down nine-tenths of a percentage point from the fourth quarter of 2015 overall and by a much larger margin for minority groups that have long gone without health insurance coverage. The new Gallup analysis comes amid a heated presidential campaign in which two of the three remaining GOP candidates – Donald Trump and Sen. Ted Cruz of Texas -- regularly vow to repeal the Affordable Care Act and replace it with an alternative plan that neither candidate has defined yet. On the Democratic side, Sen. Bernie Sanders of Vermont is promoting a costly single-payer national healthcare program that would supersede Obamacare and guarantee health coverage for all Americans. However, former secretary of state Hillary Rodham Clinton has opposed that approach, saying it would be absurd to replace Obamacare now when only little more than a tenth of Americans are still in need of coverage. Instead of replacing Obamacare, she says, Congress and the next president should build on it. "We had enough of a fight to get to the Affordable Care Act,” Clinton said earlier this year in a debate. “So I don’t want to rip it up and start over." Viewed another way, the share of Americans struggling without health insurance dropped by nearly 40 percent between 2014 and early this year, according to the Gallup findings. The net improvement of coverage for minorities has been the most dramatic. For example, the percentage of uninsured blacks dipped from 20.9 percent in the fourth quarter of 2013 to 11.4 percent in the first quarter of this year, a net improvement of 9.5 percentage points. Hispanics did even better, with their uninsured rate falling from 38.7 percent to 28.3 percent during that same period – a net improvement of 10.4 percentage points. By contrast, the uninsured rate among white Americans dropped from 11.9 percent to 6.4 percent, a 5.5 percentage point improvement. The survey targeted adults ranging in age from 18 to 64 (since nearly all Americans 65 and older qualify for Medicare). Gallup found that the lion’s share of increased coverage was among adults who fully paid for their own policies – up 4.2 percent points from the fourth quarter of 2013 -- and those qualifying for expanded Medicaid for the poor under the Affordable Care Act – up 2.5 percentage points to 9.4 percent. From an income perspective, the biggest improvement was among low-income Americans making less than $36,000 a year. According to the findings, that uninsured rate among that group dropped from 30.7 percent to 20 percent. According to the Kaiser Family Foundation, the number of people without health insurance increased from 2000 to 2010 largely because of decreasing employer sponsored insurance coverage and rising healthcare costs. That trend only worsened during the Great Recession, when many people lost their jobs – and their health insurance.